Are you using a hook and eye at the front closure? The chenille yarn trim is genius – so effective on this design. 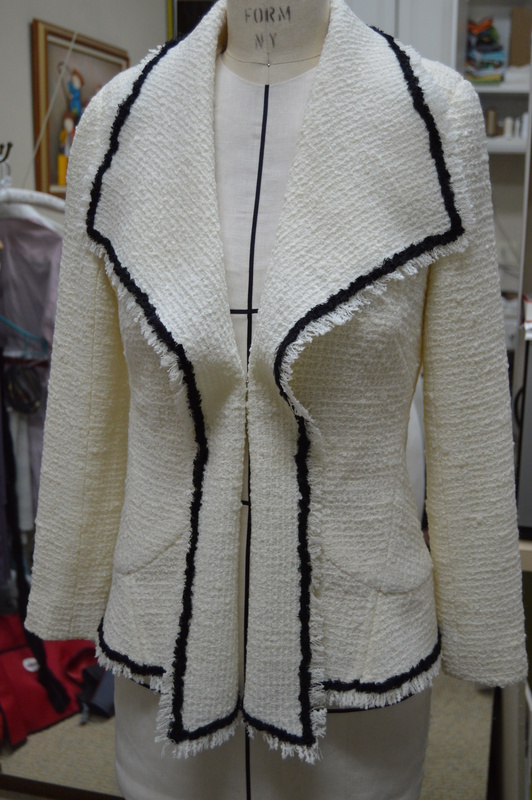 This jacket is quite stunning – so much better than the pattern would have one think! Yes I used two large hooks at the center front. They were sewn on before the lining and so just peek out. I’ll use interesting yarn again for trim. It’s soft and flexible. Also much less expensive; even pricey yarn has 80-100 yards per skein. 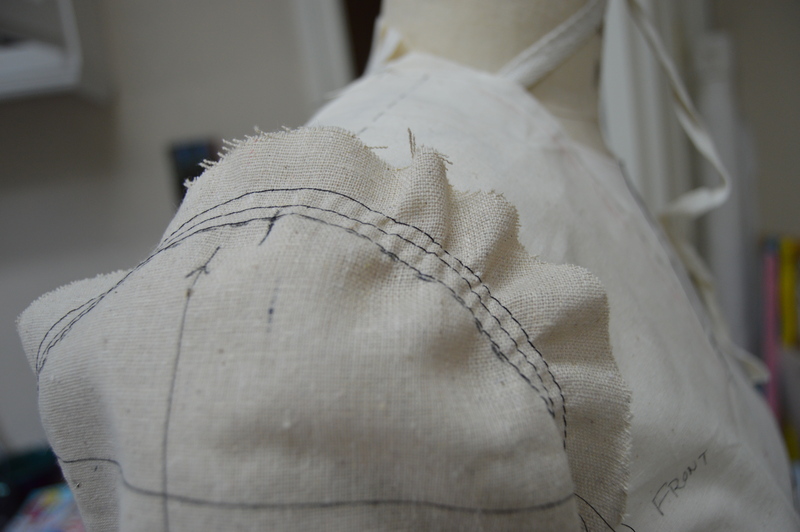 Snugging the back of the armhole to create a pocket for shoulder blade is genius! How did you apply the yarn? Your changes made the design so much better than the pattern. I whip stitched the chenille yarn from the underside using cream thread. On the collar where the trim needed to be on both sides I used black thread to tack it down from the right side. The black stitches were hidden by the yarn. Thanks for the compliment. I often find patterns can’t be followed blindly. You need to consider the final effect. Wow, what a gorgeous jacket!! 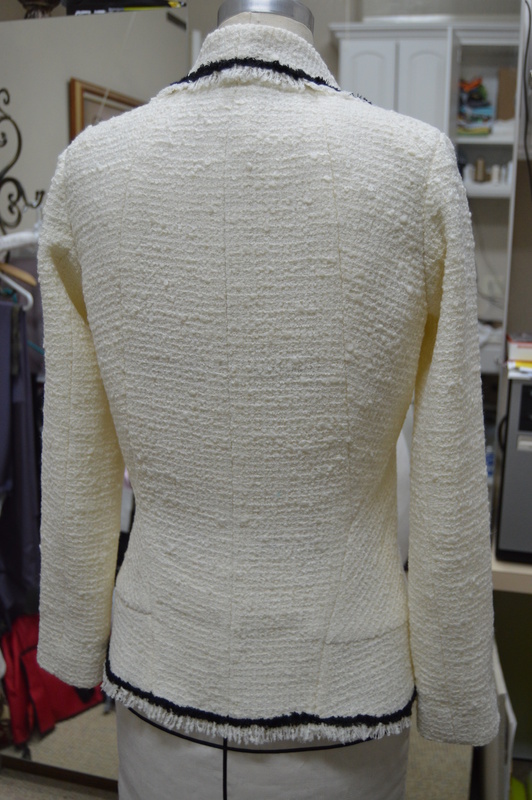 It’s lovely in that light color boucle – subtle but I can see the interesting seam lines. Very inspiring!! Thanks. Hope you post photos of your interpretation. It’s beautiful. So much work goes into lovely garments. Your trim choice is genius. Sleeves/shoulders are such a fitting conundrum. Thank you for showing all the fitting details and changes. I have never heard of snugging the back of the armhole, and have filed that for future reference. I do hope you’ll model the jacket for us! Thank you. I will get a photo of me wearing this up. Too late last night to get one. Wow! I knew this would work well in terms of the seaming but the draped collar is special too. How beautiful it looks now. I love the fringed edges – so soft. Lovely work, as ever Mary. Can’t wait to see how you approach the wedding dress…. Thank you. This turned into a much more interesting project than I first thought. Now I may do another variation. Thank you for the compliment Hopefully our paths will cross and I’ll get to meet you in person. Your work is sensational. Thank you so much for allowing us to follow you on this jacket. I had already purchased the pattern and so will follow your instructions post by post. I hope my suggestions help. Send a note if you need anything clarified. I would love to see your creation. Your jacket is stunning. I love that you used yarn for the trim, what a fabulous idea – need to borrow that one 🙂 The collar stand is ingenious and will work a treat. Thank you. I am going to experiment more with yarn as trim. It is much softer than many available trims and less expensive. Not really sure which seams you are referring to. 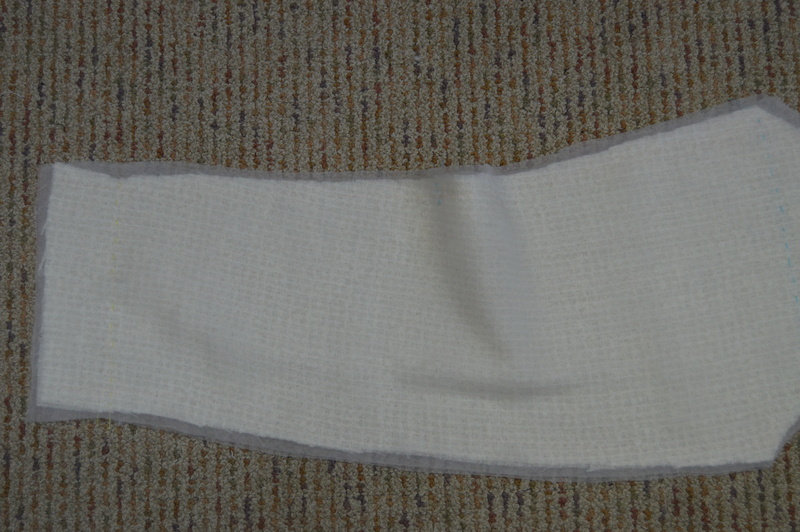 The only seam I added was at the center back of the collar. I chose to do this because I wasn’t sure how much to ease the collar/front drape section and wanted the flexibility of adjusting the position of the collar center back. Beautiful jacket. I like how you used felt to support the collar at the back. I have a jacket made for me and the flounce collar sits flat which I don’t like. I’ll try giving it support with some fabric and interfacing. Thanks for showing that. Just to clarify about the collar stand: hair canvas was pad stitched to the felt. If you try felt alone it might not have the necessary stiffness to support the collar. Hope it works for you. Just gorgeous, and much more haute couture than the original. I bet it’s a dream to wear. Love the tips about snugging the sleeve and the collar stand. Thanks. I’m already planning other versions. Adding that felt collar stand just makes such a difference and will keep the back neck looking crisp after many wearings. Your jacket just has a life of it’s own and make one want to touch it. The feel of wearing it must just be like heaven with the delicious lining and interfacing. I realized the collar neck needed more support and this seemed like the perfect fix. I love following your blog. I also make/alter wedding gowns and roll with laughter at your stories. I sympathize with you when dealing with a bride who wants a “simple alteration,” having NO understanding of what’s involved. 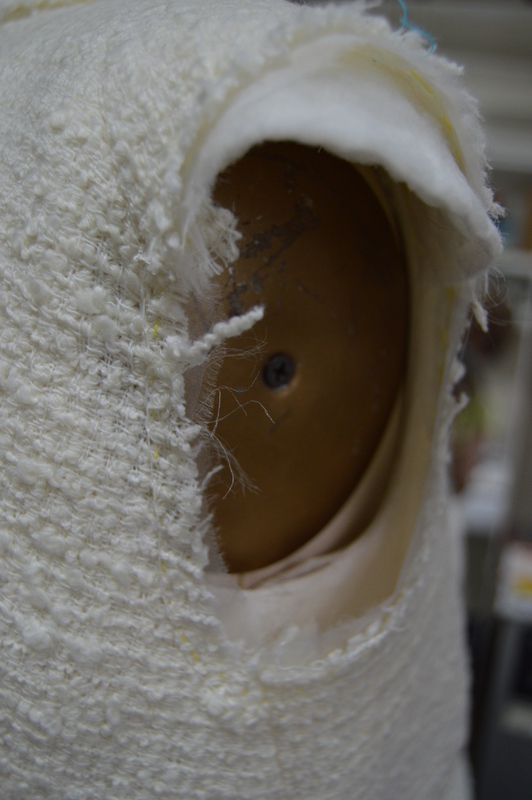 I hope you follow my wedding gown construction. It’s such a joy to work with a bride who wants luxury fabrics, couture level construction and is willing to pay for that. I certainly will Mary…we all learn things along the way and since I have no time to sew wedding gowns from scratch, your posting will truly lift my spirits! 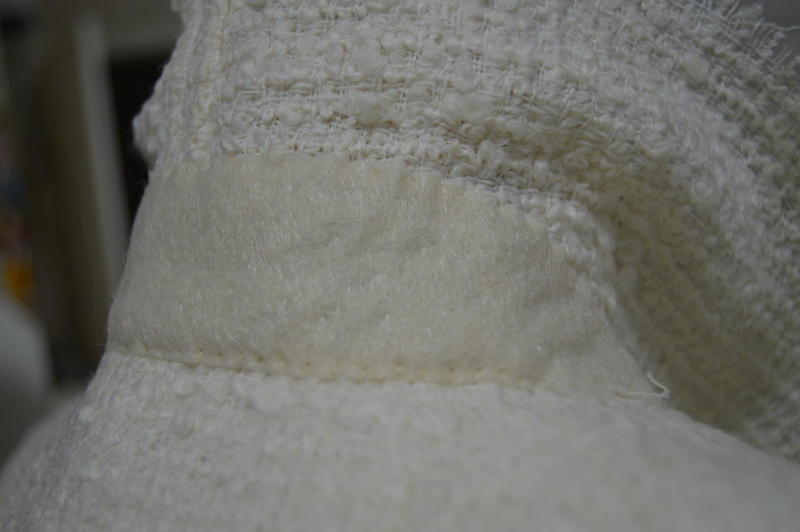 Pardon me but……………..what do you mean by snugging up the back of the armhole? I can’t tell by the pictures and wonder what you mean. I think I understand the end result but don’t know what you did? Help me just a little bit more and thank you for all that you do for us. 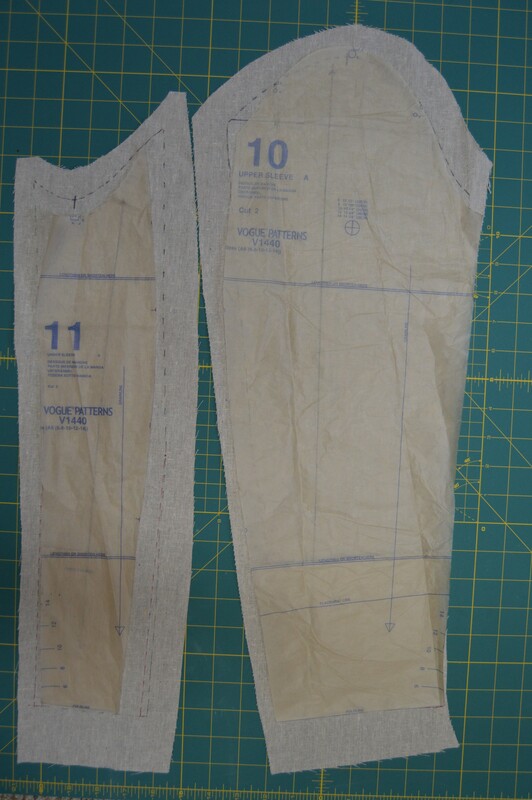 The best illustration of easing the back armhole to create a poket for the shoulder blade is covered in “Vintage Couture Tailoring” by Thomas Von Nordheim. 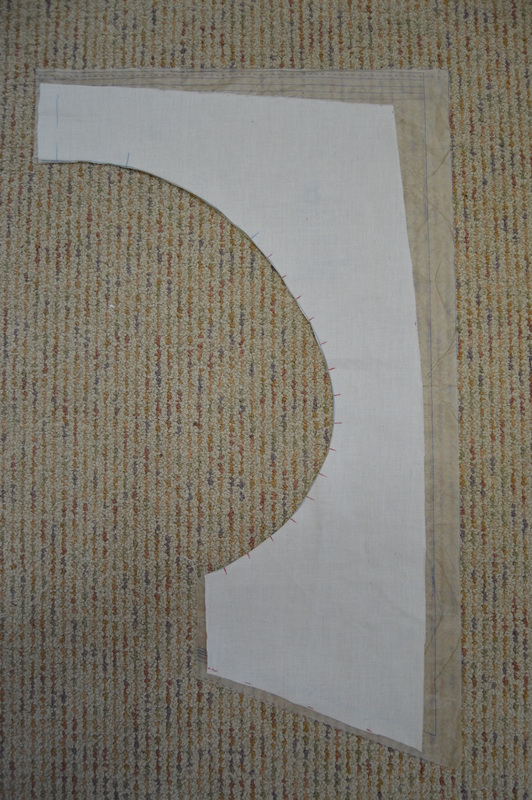 It’s in the chapter dealing with sleeves and is a hand sewn chain stitch which pulls in the back armseye. You shrink in the fullness with steam before setting the sleeve. I’ve shown this in the fifth photo but since it’s in matching thread, it is difficult to see. I have readers whose expertise ranges from beginner to expert and so sometimes I gloss over a few points. Hope this helps clarify and please email me if you have further questions. Boucle is just so easy on the eye. 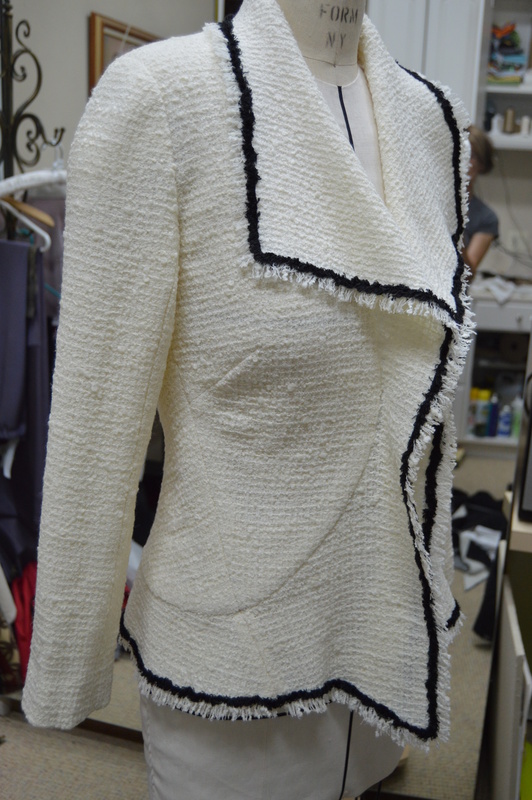 This jacket is a beauty – and I love the addition of some extra support on the back collar. The Vintage Couture Tailoring is a book that’s been on my wishlist for quite some time… one day soon! That circular seam at the front is just so lovely. Thank you. This pattern required major tweaking but I’m happy with the final result. Welcome back and enjoy your new home. I have just seen this jacket and it is absolutely beautiful! Thanks for sharing. Thank you so much for the compliment. Glad you enjoyed. Just bought this pattern. I appreciated all your tweaks. 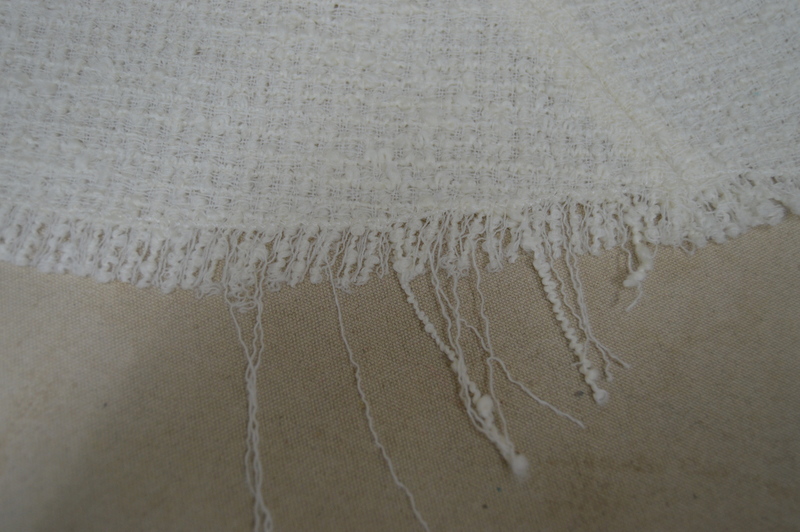 The restrained fringe and chenille is very elegant. Thank you. Hope my notes help you perfect the fit.